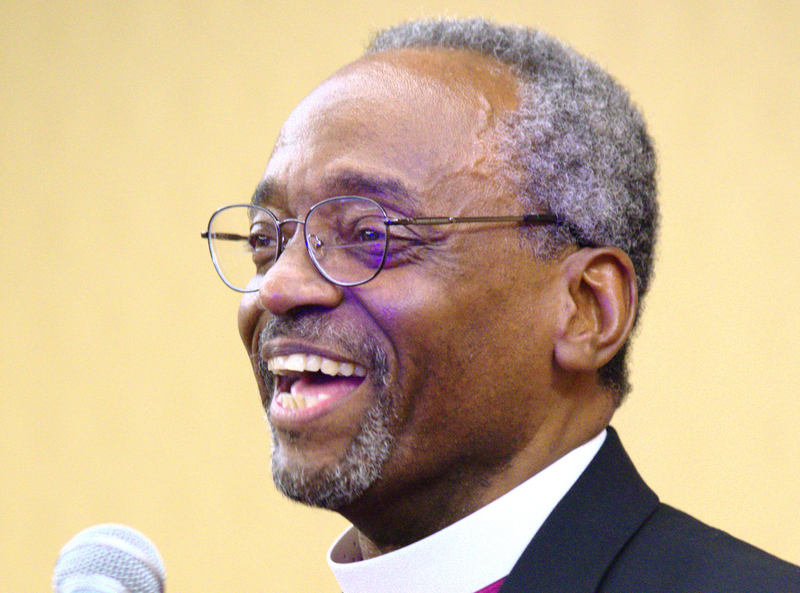 Presiding Bishop Michael Bruce Curry comes to Rochester this November! This November, Episcopal Church Presiding Bishop Michael Bruce Curry will be present at several public forums and worship services in the Episcopal Diocese of Rochester. A native of Buffalo, Curry graduated from Hobart & William Smith Colleges in Geneva and earned a Master of Divinity degree in 1978 from Yale University. Before becoming presiding bishop, he served as the 11th Bishop of the Diocese of North Carolina. He is the author of Crazy Christians: A Call to Follow Jesus. Bishop Curry is the first African American presiding bishop of the Episcopal Church and is widely regarded as one of the leading preachers in the United States. He speaks frequently on matters of social justice, equality, and reconciliation. Thursday, November 3, 2016, 7 p.m.
Christ Episcopal Church in Pittsford Offers A Choral Evensong — with a special homily delivered by the Most Rev. Michael Bruce Curry, presiding bishop of the Episcopal Church. Join members of Christ Church and people from around the Rochester area for this service of beautiful choral music, prayer, and a reflection by one of the world’s most captivating religious leaders. Music led by David Baskeyfield, internationally known concert organist and 2011 first-prize winner at the St. Albans International Organ Competition. Free and open to the public. Friday, November 4, 2016, 10:00 a.m. to 12:00 p.m. Parking: Lots S, T, and I only. See map. Join us for a morning workshop with the Rev. Canon Michael Hunn and Presiding Bishop Michael Curry, which will coincide with our Presiding Bishop’s visit in November. Organized by St. Michael’s in Geneseo and to be hosted on campus at SUNY Geneseo, the workshop is scheduled for Friday, November 4, from 10 a.m. to noon. Canon Hunn, Canon to the Presiding Bishop for Ministry Within the Episcopal Church, will lead the workshop - focused on the freedom of reconciliation as a means to non-violently address race and racism. Bishop Curry will open and close the event. Friday, November 4, 2016, 7 p.m.
During his visit to campus this November to deliver a President's Forum Series lecture, the Hobart College Alumni Association will bestow its highest honor, the Medal of Excellence, on Michael B. Curry '75, the 27th Presiding Bishop of the Episcopal Church of the United States. A former member of the HWS Board of Trustees, Curry was installed to his current role on Nov. 1, 2015, becoming the first African-American to hold the Church's top office. A former bishop of North Carolina, Curry currently serves as the Chief Pastor and as President and Chief Executive Officer of the Domestic and Foreign Missionary Society and chair of the Executive Council of The Episcopal Church. Curry joins the President's Forum on Friday, Nov. 4, with a free public talk beginning at 7 p.m. in the Vandervort Room of Scandling Campus Center. The Medal of Excellenceceremony will be held in conjunction with the talk. Sunday, November 6, 2016, 10 a.m. to 12 p.m.
Join members of St. Paul’s, Rochester, for this special service on All Saints’ Sunday. The Most Rev. Michael Curry, Presiding Bishop of the Episcopal Church, will preach at St. Paul’s. Coffee reception to follow. All are welcome. Sunday, November 6, 2016, 3 p.m. to 5 p.m.
Join the Most Rev. Michael Curry, Presiding Bishop of the Episcopal Church, and leaders from around the Rochester region for a forum discussion on three interlocking forces that continue to challenge our society: poverty, racism, and violence. The event will focus on exploring practical steps toward change. Moderated by Hélène Biandudi Hofer, host of WXXI’s “Need To Know,” the forum will be held at Rochester’s Integrated Arts & Technology High School, Benjamin Franklin Campus. The Mayor’s office, Teen Empowerment, Rural & Migrant Ministry, and others will participate.